On April, 5th 2018 our company report was broadcasted on news channel n-tv. Im Laufe des Jahres 2016 haben wir unser komplettes Managementsystem überarbeitet und an die neue Norm ISO 9001:2015 angepasst. Im Dezember wurde dieses Systems dann drei Tage lang genauestens überprüft und schließlich nach den neuen Vorgaben zertifiziert. Wir sind stolz auf all unsere Mitarbeiterinnen und Mitarbeiter, die sich mit dem System und unserem Unternehmen in solch vorbildlicher Weise identifizieren. Die aktuellen Zertifikate können Sie gerne bei uns anfordern oder sich selber unter Service – Downloads herunterladen. Our annual Christmas party was celebrated this year in a particularly festive setting. All staff members came to the lovingly decorated restaurant Zwoergis in the Olpe civic centre not only to celebrate the passing of 2015, but at the same time the end of an era. This evening, senior partner Wilhelm Peterseim announced his withdrawal from “his” company in all areas. He said good-bye to his role of managing director and partner with mixed feelings, earning sustained applause. In a moving speech, he thanked “his” employees for all their years together and stressed that he hoped above all that he had been a fair and just boss. Watery eyes and thunderous applause left no doubt about the answer. He also thanked his daughters and sons-in-law for carrying on where he left off and for now taking over the helm on their own. These days one could not take it for granted that a family business would survive for generations and continue in the hands of the family. He wished the now sole managing directors much entrepreneurial skill and great success in the coming decades. Wilhelm Peterseim emphasized that he was looking forward to his new role and now wanted to spend quality time with his loving wife Marita. After his “last” speech as managing partner, the senior partner was of course also presented with a wonderful gift from his employees. Then a short, self-made film let everyone relive the last 43 years. 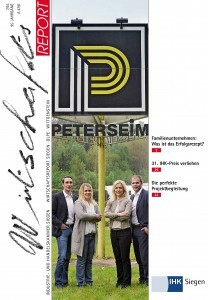 43 years, during which Wilhelm Peterseim had gone through all the ups and downs of business life and had made the company into what it is today, a very successful medium-sized family business. All of us – all of PETERSEIM – would like to thank him for his courage, his willpower, his assertiveness, his understanding and his great love for this business. He has left a mark on this company and its dominant culture and made it into a leading manufacturer of seamless drawn brass and aluminium tubes on the market, on request even finished ones. 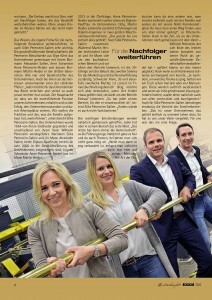 With our senior partner, a piece of PETERSEIM is also taking leave. We will miss him. But we are sure he will continue to follow the company’s development with great interest!